The California Chicano News Media Association announced Thursday it would no longer present the prestigious Ruben Salazar Journalism Awards during the National Association of Hispanic Journalism’s annual conference, opting instead to present the award at an October event in Los Angeles. The move was a direct response to an unfolding controversy involving NAHJ’s board of directors and a Wednesday vote to postpone a merger between the two Latino journalism organizations. While NAHJ maintains the organization will continue to push for a merger — a negotiation that has been underway for two years and would unite the two groups for the first time in 35 years — CCMNA said the board’s decision would undermine the deal. CCNMA’s decision to bump the Ruben Salazar awards presentation to a local conference, HispanicizeLA, a social-media focused event in Southern California, points to a growing divide between the two organizations. NAHJ President Brandon Benavides said Thursday that he was unaware of the board’s plan to review the CCNMA contract at its Wednesday meeting. The national organization was exercising its right to postpone a vote on the contract in a “good faith effort,” he said. “We wanted to make sure we know our liability and what NAHJ is responsible for,” Benavides said. Benavides cited concerns about NAHJ’s financial and legal entanglements, including a $13,000 fine from the District of Columbia and a $100 fine from the state of California due to improperly filed taxes. It was not immediately clear whether the contract had been reviewed by an NAHJ attorney. Benavides said it hadn’t been. But former NAHJ president Mekahlo Medina, who was instrumental in crafting the contract between the two groups, said the issue had been cleared. When Medina worked on the contract, he faced backlash, but decided to go through with it anyway because he said, he intended for the merger to be positive for both organizations. He also said it was a key element of his residency. “We’re stronger in numbers,” said Medina, who has been speaking on behalf of CCNMA. If a new agreement between the two associations is not reached within a month, the planned partnership will dissolve Oct. 6. NAHJ said in a statement after the Wednesday board meeting that the organization would spend the next month reviewing its partnership contract with CCNMA. Documents outlining the partnership were signed in 2015, but key provisions — namely, the hiring of an administrative manager for both groups — had not yet been implemented. In a March letter, CCNMA said that NAHJ had not held up its end of the deal and never funded the administrative position. The organization said they were “blindsided” by the vote. This is a developing story. Follow The Latino Reporter on Twitter @latino_reporter for updates. Ever since she was a little girl, Chelsea Moreno knew she wanted to be a storyteller. Born in El Paso, Texas, she grew up speaking and writing in Spanish and English, skills she hopes will advance her career. A senior at the University of Texas at Austin, Moreno is majoring in journalism with a minor in Latino media studies. 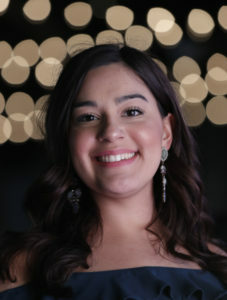 Moreno has served as the news director at Texas Student Television, where her specialties are writing, editing, and making graphics. When she’s not chasing stories and producing shows, she’s at church. God and family are very important for her, and she tries to visit her hometown as often as possible. She hopes that participating in the Student Projects will give her a chance to learn from those who have been in the business for years. In the future, she sees herself as TV producer.